Cutaneous angiosarcoma is a rare, highly malignant vascular tumor with three clinical types. It is predominantly seen in the white-skinned people and rarely dealt with among the colored races. Cutaneous angiosarcoma of head and neck of the elderly is a great mimicker with many clinical presentations. The condition needs to be differentiated from several other common conditions and the diagnosis may be extremely difficult in some cases. Herein, we report the case of a 65-year-old man with type 5 skin who presented with an unusual and extensive involvement of the scalp and face presenting a diagnostic challenge. Cutaneous angiosarcoma is a rare, highly malignant vascular tumor. There are three clinical types of cutaneous angiosarcoma which include angiosarcoma of head, neck and face of the elderly angiosarcoma associated with chronic lymphedema, and post-irradiation angiosarcoma. More than 50% of them are localized to the skin of the head and neck regions. It is predominantly seen in the white-skinned people and rarely dealt with among the colored races. Here, we report the case of a 65-year-old man of type 5 skin with cutaneous angiosarcoma of the head neck and face. The report is unusual for the rarity of the condition in type 5 skin and also due to the extensive involvement of the patient. 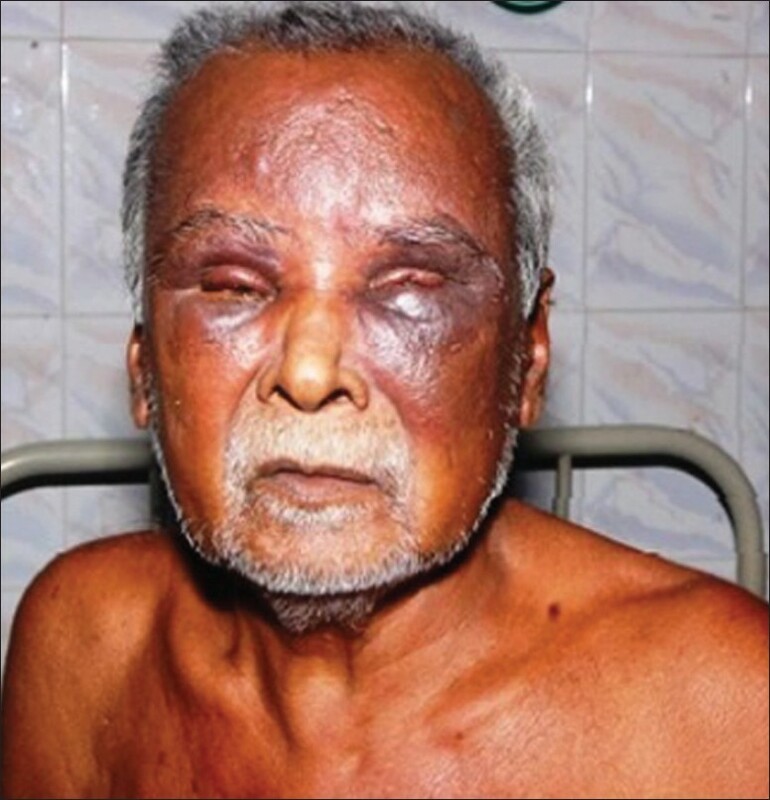 A 65-year-old apparently healthy man was referred from the ophthalmology department and reported to us with a blackish swelling around his left eye of 1-month duration, associated with severe headache. He attributed it to the fall he had sustained 1-month prior to the onset of the swelling. The lesions started as a papule over the left side of the scalp which started to bleed when the patient picked it and a few days later, he developed swelling around the left eye which was reddish and then turned black. There was no history of fever, vomiting, loss of weight, or appetite. On examining the patient's skin, a diffuse ill-defined dusky red, woody hard, hematoma-like swelling was noted around the left eye which extended up to the cheek. There was a marked edema of both eyelids, disabling the patient from opening his eyes [Figure 1] and [Figure 2]. A reddish hue along with peau-de-orange appearance of skin of forehead was noted. On the left parietal region of scalp, there was a solitary firm nodule with central ulceration (2 × 2 × 2 cm). Bluish red indurated plaques were present in the retro-auricular regions. His general physical parameters were normal and all other systems were found to be within normal physiological limits. We considered the provisional diagnoses of hematoma, cutaneous angiosarcoma of the head and neck of the elderly, and primary systemic amyloidosis. During the 2 weeks' time while under our supervision, we visualized the evolution of the swelling to the other half of the face. Investigations included complete hemogram with erythrocyte sedimentation rate, blood sugar, renal parameters, chest X-ray, ultra sonography test abdomen, computed tomography scan of the head, Echocardiogram and all were within normal limits. Skin biopsy (punch) from a representative site over the left forehead showed features suggestive of hemangioma. 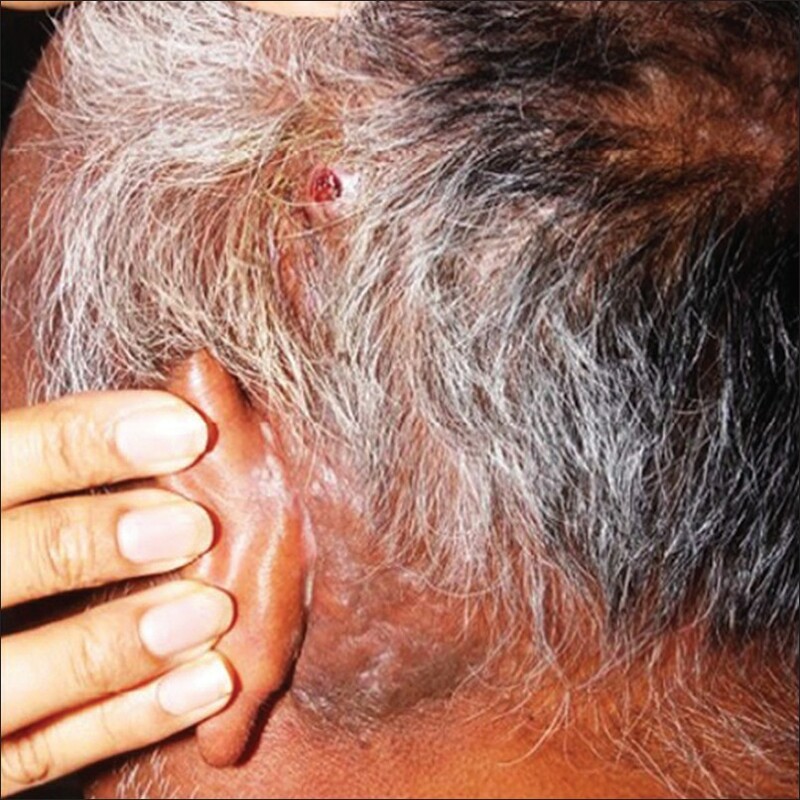 A repeat excisional biopsy of the excoriated nodule over scalp turned out to be cutaneous angiosarcoma [Figure 3]. Immunohistochemical study was positive for CD31, CD34, and Ki67, thus confirming the initial diagnosis of a high-grade cutaneous angiosarcoma. The patient was referred to a cancer institute where after appropriate discussion, he was started on radiation therapy. But the patient did not complete the treatment and was subsequently lost to follow-up. Cutaneous angiosarcoma of head and neck of the elderly is a great mimicker with many clinical presentations which include bruise-like lesion, violaceous nodules and plaques, and flat infiltrating hemorrhagic areas. They may also mimic rosacea, xanthelasma, cellulitis, and facialangioedema. , At times, the clinical presentation can mimic hematoma. Our patient presented with a hematoma-like lesion. Angiosarcoma is a fast spreading tumor with the highest rate of lymph node metastasis among all soft tissue sarcomas of the head and neck. Even though our patient had an extensive involvement of the scalp and face, the lymph nodes were spared and a thorough search for distant metastasis showed negative results. It is mentioned that in most patients, trauma alerts the presence of the lesion. Our patient had a history of fall from his bicycle prior to the onset of the lesion. Trauma was involved in 27% of patients in a case series. Though it is said that trauma is not responsible for the development of angiosarcoma, with a positive history in many patients, the authors doubt whether the relation between trauma and angiosarcoma is a mere coincidence. Histologically, angiosarcoma has variable features. The well-differentiated lesions may be misinterpreted as hemangioma or lymphangioma, whereas the poorly differentiated lesions mimic melanoma. As such, a definite diagnosis by histopathology may not always be possible.In such situations, immunostaining for markers will help in the diagnosis. In our patient, CD31, CD34, and Ki67 were positive, favoring the diagnosis of a high-grade angiosarcoma. Here, we would like to report this case for its rarity, especially in the dark-skinned individuals, the uncommon clinical presentation resembling a hematoma and the absence of metastasis in a fast spreading, extensive tumor. Dr. S. Krishnan, Professor and Head, Department of DVL, Mahatma Gandhi Medical College and Research Institute, Puducherry. 1. Rich AL, Berman P. Cutaneous angiosarcoma presenting as an unusual facial bruise. Age Ageing 2004;33:512-4. 2. Matsumoto K, Inoue K, Fukamizu H, Okayama H, Takigawa M. Prognosis of cutaneous angiosarcoma in Japan: A statistical study of sixty-nine cases. Chir Plastica 1986;8:151. 3. Mentzel T, Kutzner H, Wollina U. Cutaneous angiosarcoma of the face: Clinicopathologic and immunohistochemical study of a case resembling rosacea clinically. J Am Acad Dermatol 1998;38:837-40. 4. Ettl T, Kleinheinz J, Mehrotra R, Schwarz S, Reichert TE, Driemel O. Infraorbital cutaneous angiosarcoma: A diagnostic and therapeutic dilemma. Head Face Med 2008;4:18. 5. Calonje E, Fletcher CD. Vascular tumors. In: Fletcher CD, editor. Diagnostic Histopathology of Tumors. Vol. 1, 3 rd ed. Philadelphia: Churchill Livingstone; 2007. p. 41-81. 6. Folpe AL, Chand EM, Goldblum JR, Weiss SW. Expression of Fli-1, a nuclear transcription factor, distinguishes vascular neoplasms from potential mimics. Am J Surg Pathol 2001;25:1061-6. 7. Sangueza OP, Kasper RC, LeBoit P. Vascular tumours. Cutaneous angiosarcoma. In: LeBoit PE, Burg G, Weedon D, editors. World Health Organization Classification of Tumours. Pathology and Genetics of Skin Tumours. 1 st ed. Lyon: IARC Press; 2006. p. 245-6. 8. Panizzon R, Schneider BV, Schnyder UW. Rosacea-like angiosarcoma of the face. Dermatologica 1990;181:252-4. 9. Bray LC, Sullivan TJ, Whitehead K. Angiosarcoma of the eyelid. Aust N Z J Ophthalmol 1995;23:69-72. 10. Gündüz K, Shields JA, Shields CL, Eagle RC Jr, Nathan F. Cutaneous angiosarcoma with eyelid involvement. Am J Ophthalmol 1998;125:870-1. 11. Lapidus CS, Sutula FC, Stadecker MJ, Vine JE, Grande DJ. Angiosarcoma of the eyelid: Yellow plaques causing ptosis. J Am Acad Dermatol 1996;34:308-10. 12. Mehrens C, Anvari L, Grenzebach UH, Metze D. Unilateral eyelid swelling as an initial manifestation of angiosarcoma. Hautarzt 2000;51:419-22. 13. Tay YK, Ong BH. Cutaneous angiosarcoma presenting as recurrent angio-oedema of the face. Br J Dermatol 2000;143:1346-8. 14. Obeng MK, Hernandez A, Dastgir A, Adegboyega PA, Salinas P, Gore DC. 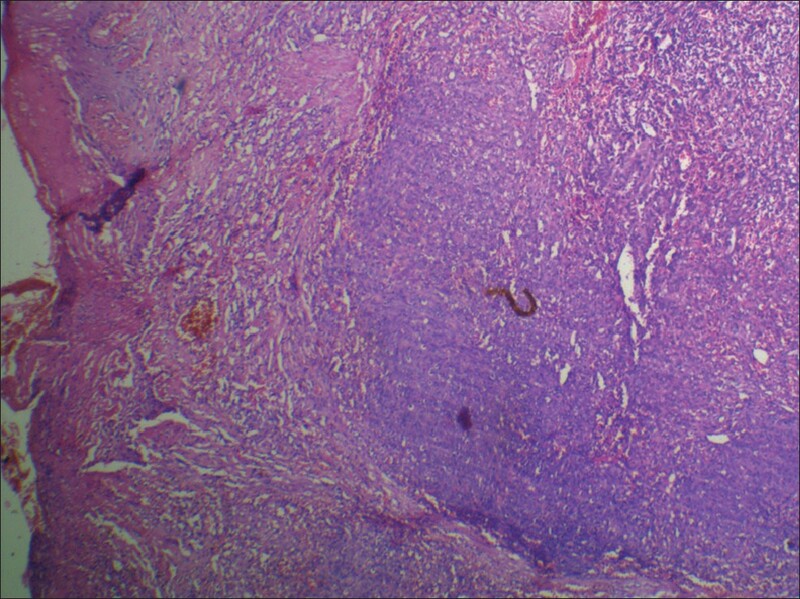 Angiosarcoma of the of scalp with calvarium involvement in a 50-year-old African-American man. J Natl Med Assoc 2004;96:1507-12. 15. Calonje E, Wilson-Jones E. Vascular tumor: Tumors and tumor-like conditions of blood vessels and lymphatics. In: Elder DE, Elenitsas R, Johnson BL, Murphy GF, editors. Lever's Histopathology of the Skin. 9 th ed. Philadelphia: Lippincott Williams and Wilkins; 2005. p. 1043-5. 16. Gupta MD, Chakrabarti N, Agrawal P, Narurkar S. Angiosarcoma of the scalp. Indian J Plast Surg 2009;42:118-21. 17. Glickstein J, Sebelik ME, Lu Q. Cutaneous angiosarcoma of the head and neck: A case presentation and review of the literature. Ear Nose Throat J 2006;85:672-4. 18. Mak KH, Tsang WY. An unusual case of the cutaneous angiosarcoma of the face and scalp. Hong Kong dermatol Venerol Bull; 2003. p. 209-13. 19. Wollina U, Hansel G, Schönlebe J, Averbeck M, Paasch U, Uhl J, et al. Cutaneous angiosarcoma is a rare aggressive malignant vascular tumour of the skin. J Eur Acad Dermatol Venereol 2011;25:964-8. 20. Kharkar V, Jadhav P, Thakkar V, Mahajan S, Khopkar U. Primary cutaneous angiosarcoma of the nose. Indian J Dermatol Venereol Leprol 2012;78:496-7.